"One moment you are reading sleepily, the next you wake up with messy hair and a strange taste in your mouth." My coworker and buddy Dustin has a hilarious post on our new McNally Robinson blog, The Common Reader, about an activity he seems to have invented (or at least named): the Booknap. Check it out for a full explanation of the technicalities of the form, along with illuminating pictures of Dustin in various booknappish poses, and getting his eye poked by William Vollmann. I feel Dustin would hate the word whimsical to describe anything he's written, but it's given me that sort of delight on a random Tuesday afternoon. It's one of those crazy days for me today (as opposed to all of the totally sane days that happen at other times, to other people... who am I kidding?) But as promised, I want to recap the ABA Day of Education, particularly the Green portions. It will be short, though. There was so much on offer at the DOE this year, and I wish I'd gotten to more. During one session I was serving on my own Graphic Novels Panel. I started out at the "Managing Blockbuster Events" panel, but was made unable to take it in by a migraine-grade headache (brought on by too much coffee, too little water, and too much hotel air conditioning, I think). I came back for the Loss Control panel, which was useful, but mostly stuff we've figured out (if not implemented) at my store already. Which leaves the Green Retailing panel. Luckily, intrepid reporter Karen Schechner has written up the whole thing for Bookselling This Week - so you can read her capable recap instead of mine. But there are a couple of things I took from this. 1) The Green Press Initiative is going strong, it's having an effect, and it's something I need to investigate more. Over 160 publishers have already signed on, and we booksellers can encourage others to do so. 2) Letting publishers know we want recycled paper books can be powerful. One great idea: a featured display table with only books on recycled or sustainable foresting paper. There's enough out there that you could keep it rotating. And display features are a good reason for publishers to give you more of that kind of books to display. - turn every possible bit of paper - obsolete reports, special order printouts, etc. - into scrap paper. It gets used for notating damaged or returnable books, writing down directions or titles for customers, and everything else you can think of -- and keeps us from having to use more paper. - re-using all of our event posters by printing on the back side. - asking every customer "Do you need [not want] a bag? ", rather than just bagging automatically -- it's saved us a lot of bags! - featuring displays of books about going green. That's what I've got, today. What is your bookstore (or other stores you visit) doing to get green? And now, that other project. Today's craziness, and a weekend conversation with the ALP, have prompted me to do something I've been meaning to do for a long time: start a blog about my bookstore startup process. I felt I needed something separate from The Written Nerd -- this place is for general industry and book-related stuff, and there's way too much bookstore stuff to include here. So I've started A Bookstore In Brooklyn just for that purpose. There's lots to report already -- today's just an intro. Check it out, spread it around, and I'll keep you posted. I've been thinking for a long time I'd like to do more talking about books around here, as well as talking about the book industry. I have the perfect place to start this week, as my buddy Steve at W. W. Norton asked if I would write about one of the best novels I've read recently. Below is what I sent to him -- perhaps less a review than a love letter for one of my very favorite contemporary authors. 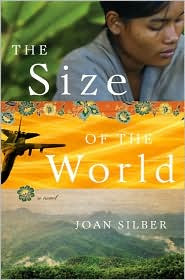 The Size of the World goes on sale today, and you can see Joan Silber reading at McNally Robinson on June 17. I honestly think Joan Silber is one of the most under-rated writers in America (even after her National Book Award finalist nod). Perhaps her voice is both too calm and too ambitious for critics accustomed to histrionic Great (Male) Novelists… but don’t quote me on that. To tell not just one life story, but over half a dozen, in first-person voices both precisely distinct and universally reflective on their own intense feelings and experiences after the fact – that’s an amazingly ambitious project. And then to call each story into question through the others, while leaving no doubt as to their essential truth, and to open up big, scary vistas onto a global landscape through these small lives – that’s almost cocky. The Size of the World, like Silber’s previous work Ideas of Heaven, is created in the genre that seems most like life to me, and yet the most artful: a set of stories that link into each other through character and incident, as interconnected as our inescapably global world. The narrators often don’t know one another, but they are connected through a dozen chains of commerce, romance, family blood, or war, from Florida to Vietnam to Thailand to Mexico to New Jersey. But this doesn’t get at why this book is so compelling. When Joan Silber tells a story, it proceeds with the pace and logic of life. One might notice a lizard on the wall, be introduced to a friend of a friend, sit down for dinner in the middle of a rainstorm – and then realize that in one of those moments one has fallen in love and life has totally changed. You read on breathlessly to find out which of these moments will change the flow of the story and catapult you into some entirely new life – a move across continents, a new passion – and it takes some doing to realize that our own lives are exactly this dramatic and tender, in the long view – and even more, to realize that our lives are connected so fiercely to each other, and to this broken and tangled world. This is one of those books that stays with you like a sweet taste in the mouth, like a new idea you keep turning over to inspect its angles. The title’s allusion to our newly small, newly vast world is teased out through specifics: emails to Thai Muslims affecting an Italian in New Jersey because of the actions of Arabs in New York, and further back because of ties of family cemented in the last days of Fascist Italy, and a conscience discovered in an American engineering lab in Vietnam, and a legacy from the days of colonialist tin mining in Thailand. It’s mind-boggling, and as familiar as the shape of our own days. Joan Silber is my hero, because she dares to see – and is able to so quietly, powerfully express – how big an ordinary life is, and to imagine therefore the vastness of all our lives touching each other. And because at the end of reading a story or a book or hers I always have to just sit, quietly, and let all of those moments wash over me, and trace the organic connections and patterns as they crystallize into beauty and truth. 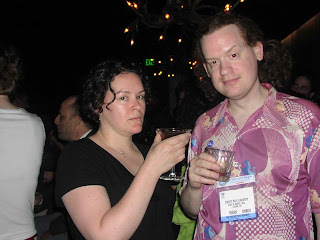 BEA Recap Part 1: IndieBound! When in the course of human events it becomes necessary for individuals to denounce the corporate bands which threaten to homogenize our cities and our souls, we must celebrate the powers that make us unique and declare the causes which compel us to remain independent. We hold these truths to be self-evident, that all stores are not created equal, that some are endowed by their owners, their staff, and their communities with certain incomparable heights, that among these are Personality, Purpose and Passion. The history of the present indies is a history of experiences and excitement, which we will continue to establish as we set our sights on a more unconstrained state. To prove this, let’s bring each other along and submit our own experiences to an unchained world. We, therefore, the Kindred Spirits of IndieBound, in the name of our convictions, do publish and declare that these united minds are, and darn well ought to be, Free Thinkers and Independent Souls. That we are linked by the passions that differentiate us. That we seek out soul mates to share our excitement. And for the support of this Declaration, with a firm reliance on the strength of our identities, we respectively and mutually pledge to lead the way as we all declare that we are IndieBound! When I first saw this video at the Publisher Forums back in January, I cried. When I saw it again at our NAIBA board meeting in April, I cried again. And as Joe Drabyak of Chester County can attest, I got goosebumps again hearing it at BEA. There were all of these people I most respected, talking about some of the ideas I hold most dear, and the things I care most about in the world. As Avin describes the "aha!" moment when a consulting company brought this idea to the ABA: "This isn't a marketing campaign. It's a revolution." It can sound a little vague if you're not sure what they're talking about, if you haven't heard Avin Domnitz' passionate introduction of the project and you don't know what IndieBound actually is. 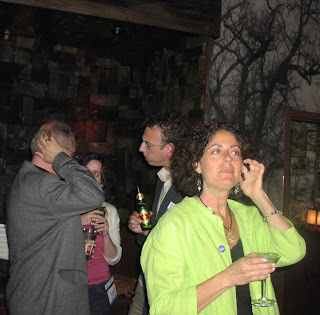 I could wish that the ABA had seen fit to explain more of IndieBound at the celebration, though they have been expounding it in various meetings and sessions before and after. But here's my take on what this is, and why it's great, and why it's going to work. I'll do it in three major points, and some rhapsodizing. 1) IndieBound renames/recreates BookSense to be more consumer-oriented. BookSense is (was) a suite of things, implemented by the ABA about 10 years ago, designed to gather the power of indie bookstores: a BookSense Bestseller list based on our combined sales, a BookSense Picks list of our favorites, and a website template and gift card module usable at all of our stores. Publishers have long understood and embraced BookSense: they proudly trumpet BookSense Picks and BookSense Bestsellers, emblazon it on their books, and market to indies accordingly. (One important idea I picked up over the course of the week: the power of indies isn't their market share, it's their cultural influence; more on that later.) But if you mentioned BookSense to most folks outside the book industry, more often than not you'd be met with blank looks. Without the budget to stage a multi-million-dollar nationwide ad campaign, the ABA was never able to create BookSense as a brand that consumers recognized. They hoped this would happen on the store level, but for various reasons it never did. 2) IndieBound builds on the growing awareness of the value of local independent businesses. 3) IndieBound can serve as a springboard for Buy Local inititatives. One of the best parts about IndieBound is that it needn't apply only to bookstores. Lots of the language of this project could apply to any independent locally owned business: the hardware store, the bar, the ice cream parlor, the coffee shop, the pharmacy. The ABA is encouraging bookstores to share these things with other businesses, and build awareness of buying local throughout our communities. Some lucky communities already have strong Buy Local movements; they may not need this component, or they may tailor it to work together with what they already have. But for those who don't, this is an efficient and effective way to work together with other businesses to get across the message we all know so well: you have to shop at your local businesses if you want them to continue to exist. It's a funny revolution -- as I pointed out the first time I heard about it, it's a capitalist revolution, and on a basic level we booksellers are hoping it will help us make money. But the very fact that we're independent booksellers reveals the embarrassing truth that we're not in it just for the money. We're in it because we believe in something: the power of the written word, the joys of a day spent among paper and ideas and people with questions, the people themselves -- regulars and kids and tourists and neighbors, hungry for something that we can provide. Books. Culture. Community. I think IndieBound gives us ways to express that passion that customers will understand. All of us bookstores will be getting a big box soon full of more information about IndieBound and how we can use it. Part of the strength of this revolution is that it's got good propaganda: posters, shelftalkers, flyers, banners, clothing we can wear or sell. 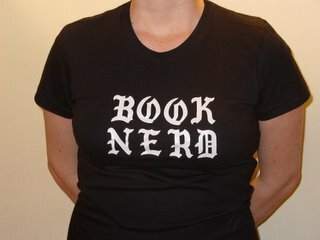 I've got a t-shirt that I've been wearing a lot already, that's only available for booksellers. In white letters on a red background, it says "THIS IS THE PART WHERE I SAVE THE DAY." Yeah, it makes me feel like a superhero (perhaps a slightly ironic superhero, which just makes it all the more hip.) And yeah, I really believe indie booksellers can save the day, just by making a place where people can come together over books. The IndieBound graphics and rhetoric tap into a 1960s idealism -- my hero Lucy Kogler of Talking Leaves in Buffalo said they remind her of Woodie Guthrie -- but I love them because they're also contemporary, and young. It's no secret that I'm an advocate for the younger generation in bookselling, and for younger readers. And I think it's important that IndieBound conveys that indie bookstores are not a quaint relic of the past that we should try to delicately preserve in amber if possible -- they're a live thing, a powerful force in the contemporary world, and they're growing. But you don't have to take my word for all this. I'm just one kid who's gets choked up about some pretty geeky stuff. There's a lot of enthusiasm out there, as well as some confusion and criticism. As an early adopter or "IndieBounder," I just got an email from the ABA with links to lots of other places where people are talking about the project. Click on any of the below to see what other folks are saying. And PLEASE, if you have thoughts, I'd love to see your comments. This is something we're going to be talking about for a long time. Publishers Weekly article "IndieBound or Bust"
Shelf Awareness article covers the reveal and the specifics of the program, and interviews the ABA's Meg Smith about the reasons behind the change. Book Browse likens IndieBound to Boston Tea Partiers with our "Independent Revolution." One of the members of the consulting company Brains on Fire, which developed IndieBound, finally got to spill the beans in her blog. Amy Goodman of Democracy Now (who gave a great lunchtime address at the Day of Education) interviewed outgoing Board President Russ Lawrence about IndieBound. You can watch a video of the interview or read a transcript. Bookavore Stephanie Anderson gives some pretty glowing praise. 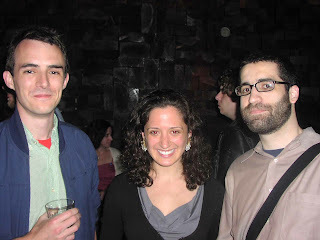 Kristin of Wild Rumpus gives a pretty good overview--and a peek into her psyche. Michael Leiberman of Book Patrol has some criticism for the program. The Southern Independent Booksellers Alliance gets some reactions from bookselling and publishing names. 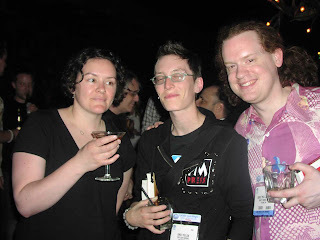 Indie publisher Deb Robson of Nomad Press gives her thoughts on IndieBound. As a bonus, there's a great reader comment about the carbon footprint difference in buying local versus online. Live from BEA -- PW covered the ABA Town Hall and Membership meetings, where there was much discussion of what IndieBound really is. Paul Constant of The Stranger's Constant Reader doesn't seem too thrilled with the new campaign . Gwen Dawson of Lit License is a little confused by the message. Patrick at The Millions thinks the movement has promise--and be sure to check out the comments, they’re pretty interesting. HeyNowYeah saw us on Democracy Now and thinks the message and focus are good, and serve as a reminder of "personal economic ethics." The AP covers the launch--not as important as the Kindle, eh?--and has as interesting look at Penguin's CEO David Shanks' skepticism about the future of indies. Hopefully IndieBound is an answer to that!